The Shared Decision Making Committee at Washington Drive Primary School consists of a collaborative team of parents, administrators, and faculty members. The purpose of the committee is for the team to work collaboratively to guide school improvement activities. 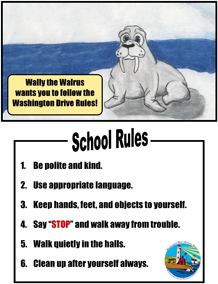 Over the past few years, our committee has worked to develop our “Bus Safety Superstars Program”, our student handbook, our school song, and our school motto – “Learning comes alive at Washington Drive”. The committee will find new ways to help students understand appropriate behavior in the lunch room, on the playground, and on the buses. The committee will focus on ways to have students better understand the academic vocabulary for character education. Each month, teachers will choose two students who showed character in or out of their classroom. A letter will be sent home to let parents know that their child showed acceptance, bravery, courtesy, dependability, or empathy. Each wing in the school is named after a character education trait. Learning really does come alive at Washington Drive! !